Fort Lee, NJ, September 10, 2013 / PRNewswire / – Pioneer Power Solutions, Inc. (OTC: PPSI) (“Pioneer” or the “Company”), a manufacturer of specialty electrical transmission and distribution equipment for applications in the utility, industrial and commercial markets, today announced the acquisition of select assets from Pico Electrical Equipment, Inc. and Pico Metal Products, Inc. to form Pioneer Custom Electrical Products Corp. (“Pioneer CEP”). In addition, the Company announced increased earnings guidance for 2013. 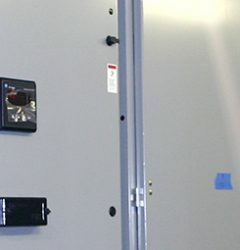 Pico, a manufacturer of low voltage switchboards, panelboards and custom electrical enclosures, is based in the greater Los Angeles metro area and primarily serves the Southern California market from its 40,000 square foot facility. Pioneer has retained Pico’s existing 14 employees and has commitments from an additional six professionals who are expected to augment the unit’s selling, engineering and manufacturing activities. Pioneer named Geo Murickan, a well-established industry veteran, as President of the new subsidiary which will do business as Pioneer CEP. Mr. Murickan’s experience spans more than 20 years, principally at General Electric, and more recently at Myers Power Products, a major independent manufacturer of electrical switchgear products where he was executive vice president of sales and marketing. The Company today updated its full-year guidance, originally issued on April 1, 2013. Revenue guidance remains unchanged and is expected to be in the range of $89 million to $95 million for the full year of 2013, including $2-3 million in switchgear and switchboard apparatus-related revenue stemming from acquisitions completed in 2013. The Company increased its guidance for non-GAAP EPS to $0.80 to $0.86 per share, up from $0.74 to $0.80 per share in the original guidance issued April 1, 2013. Pioneer Power Solutions, Inc. is a manufacturer of specialty transmission and distribution equipment and provides through its five operating subsidiaries, Pioneer Transformers Ltd., Jefferson Electric, Inc., Bemag Transformer Inc., Pioneer Critical Power Inc. and Pioneer Custom Electrical Products Inc., a broad range of custom-engineered and general purpose solutions for electrical applications in the utility, industrial and commercial markets. The Company is headquartered in Fort Lee, New Jersey and operates from eight additional locations in the U.S., Canada and Mexico for manufacturing, centralized distribution, engineering, sales and administration. To learn more about Pioneer, please visit our website at www.pioneerpowersolutions.com. This press release contains “forward-looking statements” within the meaning of the Private Securities Litigation Reform Act of 1995, as amended, including, without limitation, the quotations of Mr. Mazurek and Mr. Murickan set forth under the heading “Pico Acquisition, Formation of Pioneer CEP” and the financial guidance and quotation of Mr. Minkow set forth under the heading “Updated Guidance for the Year Ending December 2013”. Such statements may be preceded by the words “intends,” “may,” “will,” “plans,” “expects,” “anticipates,” “projects,” “predicts,” “estimates,” “aims,” “believes,” “hopes,” “potential” or similar words. Forward-looking statements are not guarantees of future performance, are based on certain assumptions and are subject to various known and unknown risks and uncertainties, many of which are beyond the Company’s control, and cannot be predicted or quantified and consequently, actual results may differ materially from those expressed or implied by such forward-looking statements. Such risks and uncertainties include, without limitation, risks and uncertainties associated with (i) general economic conditions and their effect on demand for electrical equipment, particularly in the commercial construction market, but also in the power generation, industrial production, data center, oil and gas, marine and infrastructure industries, (ii) the effects of fluctuations in sales on our business, revenues, expenses, net income, earnings per share, margins, profitability, (iii) the fact that many of the Company’s competitors are better established and have significantly greater resources, and may subsidize their competitive offerings with other products and services, which may make it difficult for the Company to attract and retain customers, (iv) the Company’s dependence on Hydro-Quebec Utility Company and Siemens Industry, Inc. for a large portion of its business, and that any change in the level of orders from these customers could have a significant impact on the Company’s results of operations, (v) the potential loss or departure of key personnel, including Nathan J. Mazurek, the Company’s chairman, president and chief executive officer, (vi) the Company’s ability to expand its business through strategic acquisitions, (vii) the Company’s ability to integrate acquisitions and related businesses, (viii) the Company’s ability to generate internal growth, maintain market acceptance of its existing products and gain acceptance for its new products, (ix) unanticipated increases in raw material prices or that disruptions in supply could increase production costs and adversely affect the Company’s profitability, (x) restrictive loan covenants and/or the Company’s ability to repay or refinance debt under its credit facilities could limit the Company’s future financing options and liquidity position and may limit its ability to grow its business, (xi) the Company’s ability to realize revenue reported in its backlog, (xii) operating margin risk due to competitive pricing and operating efficiencies, supply chain risk, material, labor or overhead cost increases, interest rate risk and commodity risk, (xiii) strikes or labor disputes with employees may adversely affect the Company’s ability to conduct its business, (xiv) since a majority of the Company’s revenue and a significant portion of its expenditures are derived or spent in Canadian dollars, while the Company reports its financial condition and results of operations in U.S. dollars, fluctuations between the U.S. dollar and the Canadian dollar will impact the amount of the Company’s revenues and earnings, (xv) the impact of geopolitical activity on the economy, changes in government regulations such as income taxes, climate control initiatives, the timing or strength of an economic recovery in the Company’s markets and its ability to access capital markets, (xvi) the Company’s chairman controls a majority of the Company’s combined voting power, and may have, or may develop in the future, interests that may diverge from yours, (xvii) future sales of large blocks of the Company’s common stock may adversely impact the Company’s stock price, and (xviii) the liquidity and trading volume of the Company’s common stock. More detailed information about the Company and the risk factors that may affect the realization of forward-looking statements is set forth in the Company’s filings with the Securities and Exchange Commission, including the Company’s Form 10-K filed with the SEC on April 1, 2013 and its Form 10-Q filed with the SEC on August 14, 2013. Investors and security holders are urged to read these documents free of charge on the SEC’s web site at www.sec.gov. The Company assumes no obligation to publicly update or revise its forward-looking statements as a result of new information, future events or otherwise.